The Atrium Gallery is flooded with natural light by large skylights in the cathedral ceiling of its spacious atrium. Cedar paneling in the ceiling and exposed brick walls are complimented by the marbled finish and geometric pattern of the newly-resurfaced non-slip floor. A brick fireplace and arm chairs anchor the room. At a generous 1,800-sq ft in area, the Atrium Gallery is the perfect setting for an evening reception or cocktail party. The Atrium Gallery is home to The Meeting House Gallery, which mounts exhibits of artwork by regional artists several times a year. Parking at The Meeting House is free for clients and their guests. The fully-lit parking lot, which is adjacent to the Oakland Mills Village Center, has 250 parking spaces and 7 accessible spaces for people with impaired mobility. A community policing center is located across the street on the village center property. The Kitchen for catered events features commercial-grade appliances and equipment: two gas range tops and ovens, a range hood, a microwave, a proofing/holding cabinet and trays, three stainless steel work tables on wheels, two deep stainless steel sinks with pre-rinse faucet, an under-counter dishwasher, a freezer, a refrigerator, an ice machine and a separate sink for hand washing. A rear caterer's entrance and parking bay allows for easy loading and unloading. Room 100, Room 201 (with folding partitions in place), the Room 200 Complex (without folding partitions in place), and the Atrium Gallery are accessible via separate doors off the kitchen. Restrooms at The Meeting House were most recently renovated and expanded in 2007 to better accommodate large events. The restroom improvements met ADA requirements that were in place at the time of the renovation. The women's room features 7 stalls, 5 sinks, a baby-changing station and a seating area. The men's room features 4 stalls, 5 urinals, and 4 sinks. The Baptistery or Baptismal Pool is adjacent to Room 100. The heated pool accommodates full-immersion baptism, which can be viewed from Room 100 through a window with sliding doors. The pool and changing facilities are accessed through Room 100 or the kitchen. Users must navigate a short flight of stairs in the hallway and another set of stairs into the pool. It is not readily accessible to those with mobility impairments. 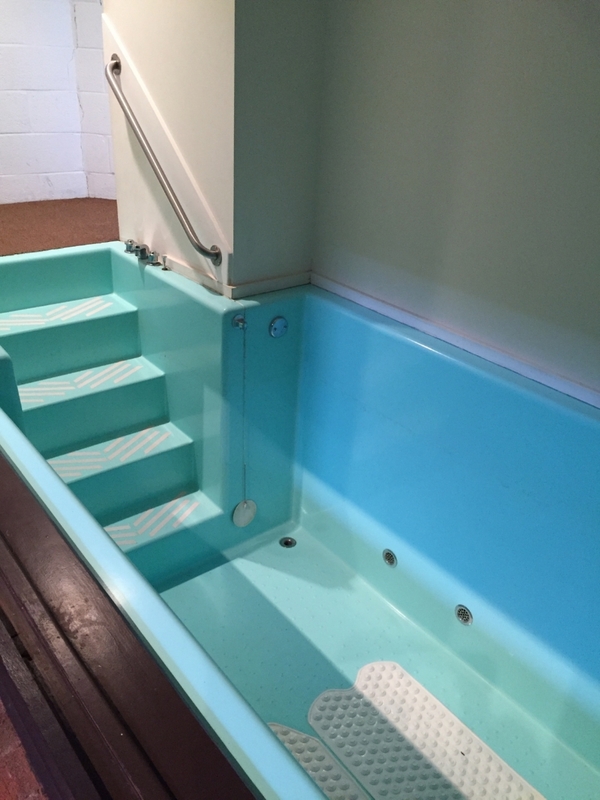 The baptismal pool is available for rent by individuals who are not members of the OMIC congregations. The Meeting House Grounds encompass 6.4 acres in the heart of Oakland Mills Village. The grounds feature expansive flat grassy areas, rain gardens to manage runoff, a Peace Garden maintained by Columbia United Christian Church, a fully-equipped playground maintained by Nurturing Nest Montessori School, and a large, 250-space parking lot. The Meeting House is adjacent to the Oakland Mills Village Center and CA ice skating rink, and across the street from Oakland Mills Middle School. In 2015, OMI's Green Team participated in the Trees for Sacred Places program initiated by the Alliance for the Chesapeake Bay and Interfaith Partners for the Chesapeake. The program provides saplings and shrubs at no cost to faith-based facilities to enhance their landscaping and support watershed restoration efforts. The Peace Garden is maintained by Columbia United Christian Church. It features a Peace Pole with the inscription "May Peace Prevail on Earth" in 4 languages. The Peace Poles, now found in almost every country on earth, are an international project of the World Peace Prayer Society. From Spring through Fall, the garden's blooming perennials add a splash of color to The Meeting House grounds between the main entrance and village center. The garden is bordered by a railing and is not accessible to foot traffic. Nearby Area The Meeting House is adjacent to the Oakland Mills Village Center. The village center has a convenience store, eateries (Chinese and Thai restaurants, a pizza & sub shop, a drive-thru pizza shop, and a pub), The Other Barn (a neighborhood community center), and a community policing station. A pharmacy is located in the Stevens Forest Professional Center at the southwest corner of the property. Across the street are the Columbia Association's indoor ice rink and Oakland Mills Middle School. Columbia's extensive bicycle and walking trails are just steps away.